Mailing lists are collections of contacts (both people and organizations) with whom you communicate as a group on a regular basis. One-time lists are mailing lists that you only need, as the name makes plain, for a one-off communication. When you send a communication to either kind of list, Populi sends it to the contact's primary email or mailing address. To add people to your mailing list, click the list's name to go to its page. Click the include/exclude/edit link in the right column to start adding people to the list. 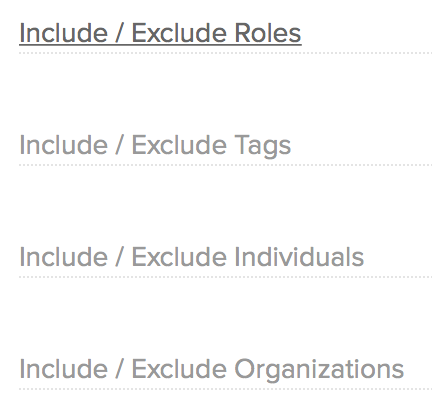 You can include or exclude roles, tags, individuals, or organizations from the list. Spouse options lets you include the spouses of list members—-which simply adds them to the list. You can also merge spouses, which combines a married couple into one recipient (e.g., John Adams and Martha Adams become Adams, John and Martha). Organization options lets you include all members of an included organization. You can also include any organizations to which belong any of the individual people on the list. As you save your changes, the Recipients list in the left column will update to show you everyone included on the list. It will also alert you to any problems with the list's recipients (like missing addresses). Send Email: Opens the email compose window with a message addressed to the list's members (who have a valid, active email address). Print Letter: Prepares a printed letter and mail-merge addressed to the people on the mailing list. Export XLS: Creates a spreadsheet of the mailing list's Recipients—which reflects the Spouse and Organization options you selected. The mailing list history records every time you've communicated with this group of contacts. You can change the visibility of any communication to allow more or fewer people to see it on recipients' Activity Feeds. One-time lists work just like mailing lists, except that you can't save them for re-use. On the main mailing lists page, click Make a one-time list. Select the list's recipients just as you would for a regular mailing list (see above). Click Email to open the email compose window with a message addressed to your recipients. Click Clear to empty your selections and start over. Click Export to create a spreadsheet of the recipients. Is there a way to make the default mail setting as BCC? I don't want all of the students to be able to see each other's e-mail addresses when we send them information. If you send a mass email from Populi from a mailing list, or by clicking something like "Email Students" in a course instance, we send the message to each recipient individually so no one will see any one else's email address. Put another way, if there are a hundred people on the mailing list, when you hit "Send", Populi sends 100 individual emails to 100 individual recipients, as opposed to one email with one recipient and 99 BCC's. Is there a way to make institution-wide mailing lists? For example, can I make a mailing list that my administrative assistant, or the Registrar, etc can see and use? Anyone with the Staff role can see any Mailing List... that includes Registrars, etc. do you guys have email or newletter templates? Im looking to use a company called "constant contact" to help me with this, but before I do that, I wanted to be sure that populi didnt already have that feature. If I were you, I'd go with Contact Contact or Mailchimp or some program like that. Populi's Communication features aren't really tailored for elaborate, HTML-rich newsletters of the type you're probably describing; they're meant more for streamlining intra-school communications. Is there a way to make my mailing list private so that everyone with staff permissions can't see it? There are certain mailing lists that are only relevant to myself, but I don't want to use the one-time list feature. When I select "student" role to create an email list, both active and non-active students are included. How do I create a list with only active students? Is there a way to add a communication plan to one of my mailing lists? If someone unsubscribes by accident (like a couple of our staff have) from a mailing list, how can they be added back on it? Is there a way to edit the mailing list? How do I drop someone from the list? @Thomas: Use Include/exclude Individuals in the right column to add/remove particular people. Thanks Brendan. I missed that edit button. Evidently, a "one time list" is nothing of the sort. It saves the recipients until such time as you manually clear them. So if you send out a "one time list" mailer, and then create and send another "one time list" mailer, the second message goes to everybody on the first list, too. You might want to clarify that before someone sends information that could be problematic. Maybe change the name of the "one time list," seeing as it isn't a one-time list?